Bilateral relations between India and Israel continue to strengthen economic and cultural ties. Retired U.S. State Department Steven J. 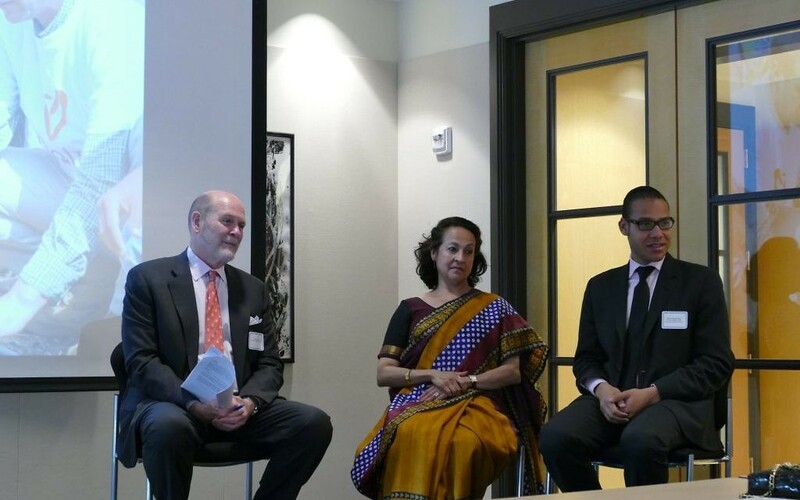 White (left), a former State Department official, India’s Maina Chawla Singh and Israel’s Shimon Mercer-Wood discuss the India-Israel relationship. The bilateral relations between the nations of India and Israel go back 25 years, but the cultural ties run much deeper. 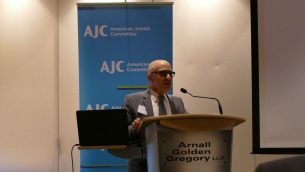 To highlight 25 years of endeavors between the two democracies, the Israeli Consulate General, Asian American Heritage Foundation, Metro Atlanta Chamber, Conexx and American Jewish Committee hosted the first India Israel US Forum on Monday, April 24, at the offices of Arnall Golden Gregory at Atlantic Station. Maina Chawla Singh, a scholar in residence at American University’s School of International Service, said more than 35,000 Israelis a year visit India, most going there after their military service. The adventurous hike in the mountains; those seeking a more relaxed vibe go to Goa. The presence of Israeli backpackers and tourists is so strong in some areas that cafes in India offer traditional Israeli cuisine, former Israeli soldiers get discounts and guest houses welcome visitors in Hebrew. Even though the Israelis usually aren’t religious, Singh said, the Chabad houses are packed on Shabbat. Indian-Israeli ties in diplomacy and security have been boosted by the first presidential visits between the countries, with India’s Pranab Mukherjee going to Israel in 2015 and Israel’s Reuven Rivlin going to India in 2016. Shimon Mercer-Wood, who handles media affairs for the Israeli Consulate General in New York, discussed growing partnerships between Israel and India in defense, trade, investment and agriculture. Farms set up in India as centers of excellence through Mashav, Israel’s agency for international development, have had a profound impact by training Indian farmers to cultivate sustainable and diverse crops, Mercer-Wood said, but the project is not an Israeli handout. “We don’t see it as aid to India but a partnership between Mashav and India, which provides most of the funding. It’s a collaborative process to produce high-value crops on small land, such as vegetables and mangos,” he said. In addition to initiatives on recycling water, enterprises are being organized toward a dairy farm while maintaining sensitivity to India’s customs. Mercer-Wood also said it is important for the United States to participate in a trilateral relationship to expand projects. 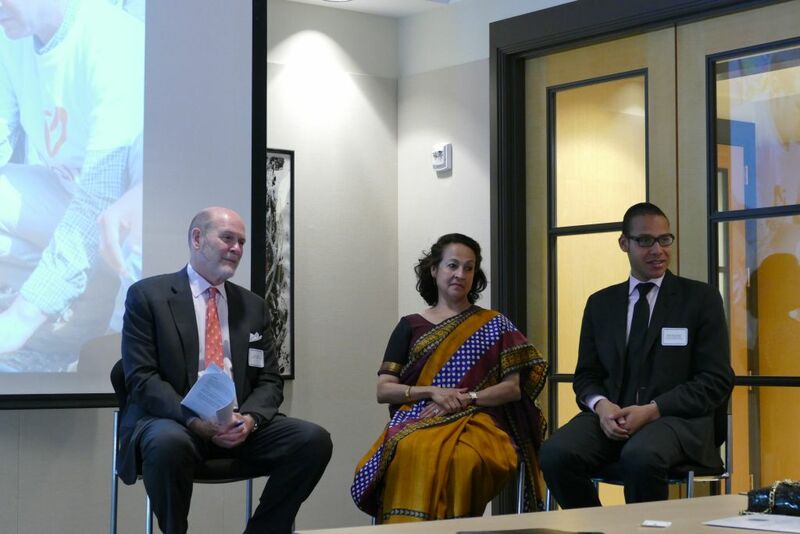 A panel consisting of Conexx President Guy Tessler, Metro Atlanta Chamber Vice President Jorge Fernandez and event co-chair Ani Agnihotri discussed the role of Georgia and the Southeast in that three-way relationship. Tessler said 55 Israeli companies are represented in Georgia, encouraged by business missions to Israel in 2014 with Gov. Nathan Deal and in 2015 with Atlanta Mayor Kasim Reed. Those connections helped Israeli company Energiya Global learn about an opprtunity and eventually win in the bidding for a solar field in Brunswick, Georgia. Georgia imports from Israel totaled $437.7 million in 2015, Tessler said, led by medical equipment, aviation and heavy machinery. Jorge Fernandez, the vice president for global commerce for the Metro Atlanta Chamber, speaks about focusing on Atlanta’s strengths to network with other cities. One strength for Atlanta is financial technology, leading to 70 percent of U.S. financial transactions being processed through the metro area, Fernandez said. The second annual Atlanta-Israel FinTech Innovation Conference will take place May 22 and 23 at Greenberg Traurig.